In this episode, Markus talk with Martin Fowler and Rebecca Parsons about domain-specific languages (DSLs). Topics covered include a definition of DSL, Internal vs. External DSLs, reasons to use DSLs and reasons not to, the DSL lifecycle and the role of language workbenches. The conversation is loosely based on their book Domain-Specific Languages. I am so glad to hear voices of such famous people! Thank you for great books and this podcast! I like the thick german accent of the conductor :-). 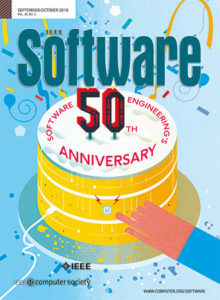 It is always a pleasure when a new episode of the Software Engineering Radio is published. I really enjoyed this one which is about one of my favorite topics. Great stuff! Thanks to all! Really loved this episode. Keep up the good work! I like the episode a lot, however I think you are making false assumptions when you say that for embedded systems DSLs must not be used to generate code against framework APIs, since those frameworks would just eat up too much resources. This is incorrect, if I may say so. One well-known example is OIL the OSEK implementation language, used to express the configuration of your OSEK RTOS. As a result of this configuration, parts of the OS are generated, working with fixed implementations of OS concepts. Another example is a wealth of automotive basic software modules which are configured in their specific configuration language and configuration code is then generated from that, again working against fixed and tested core module implementations. The book link is not working here from Denmark, i get a 404 from Amazon. I hope the new owners have the sense to interview Markus as their first guest. It seems to me that Markus was reduced to interviewing himself in this episode (which made for three guests, which was a lot). When the question of automatic translation from interpreter to compiler came up, I was surprised no one mentioned the PyPy project. It only gets you half way there, but it is able to automatically create a JIT for your interpreter with just a bit of added annotation. Thanks for the wonderful podcast! I love this episode. It is one of only a few favorited (do not delete) podcast episodes in my list. More on this subject would be awesome. What was the research project about DSLs and Excel?